Solve the mysterious puzzles with Secret Code slot machine! Here is another great slot machine by NetEnt. It invites you to play a game where you have to solve its secret codes. With 20 paylines and 5 reels, this slot machine can be clearly a good way to grab nice prizes. If you liked the book and the movie The Da Vinci Code, this slot machine is the most suitable for you. Everybody likes puzzles. Now you will have lots of fun while playing because this slot is full of mysteries that are waiting for you to solve them. In fact, you can earn high winnings. There is nothing better than this! Secret Code has stunning graphics, a dark theme with old books, parchments, statues, etc. The sound effects are also amazing, the echoes will make a more mysterious atmosphere. You will be surely amazed by the bonus games, too. Reveal the biggest secrets now! What symbols has the excellent Secret Code slot machine? Let's talk about the most important ones. Firstly, there is a Wild symbol, it's the man with a dagger and looks very upset! But don't be scared. Try to land them on reels 2, 3 or 4. If you can make it, the Wilds will expand to cover the reel when a winning line is present. The Wild symbols substitute for all other symbols except Scatter and Bonus symbols. Next, the slot machine has a golden Scatter symbol. You will be awarded with awesome free spins when 3 or more Scatters appear on the reels. During the free rounds, 2 or more of this symbol increase the multiplier by the number of the landed Scatters shown on the reels. Last but not least, a Bonus symbol which is a lock with a golden key in it. The bonus game will be activated when this symbol appears on reels 3, 4 and 5. However, note that you can get only one bonus game per spin. There are other symbols like a book with a magnifying glass, an hourglass, a man who looks like the boss of this secret society, and a woman holding a gem. Red, yellow and green rings will also help you getting nice winnings along with some cool colored runes. Check the paytable if you need more information about the symbols. So back to the bonus game: this is a very good opportunity to obtain even more winnings. If you can get into the minigame, you will see 5 statues wearing a robe and a mask without mouth. This might look creepy but wait for it. Use the keys to open the chests. Drag and drop the keys to the keyholes. When you open the chest, the statues' masks will break into pieces and you will see their faces. But the most important thing is the treasure you can find! Once you open them, they will glow and reveal the amount of winnings you earn. It's very simple, isn't it? Play Secret Code slot machine now to be entertained for a long time. Hopefully this article is helpful for every casino players. Play with real money for even more fun. You won't be disappointed! 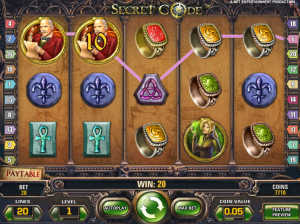 Good luck playing Secret Code online slot!